The Rest of the Story. I’ve had the wonderful privilege of testing a lot of hammock gear, and while I generally like anything related to hammocks, there are a few pieces of gear that earn a spot in my permanent gear collection. The Python Straps are one of those items. One of the reasons I like these straps is because it makes hanging a hammock easy, especially for the new hanger. 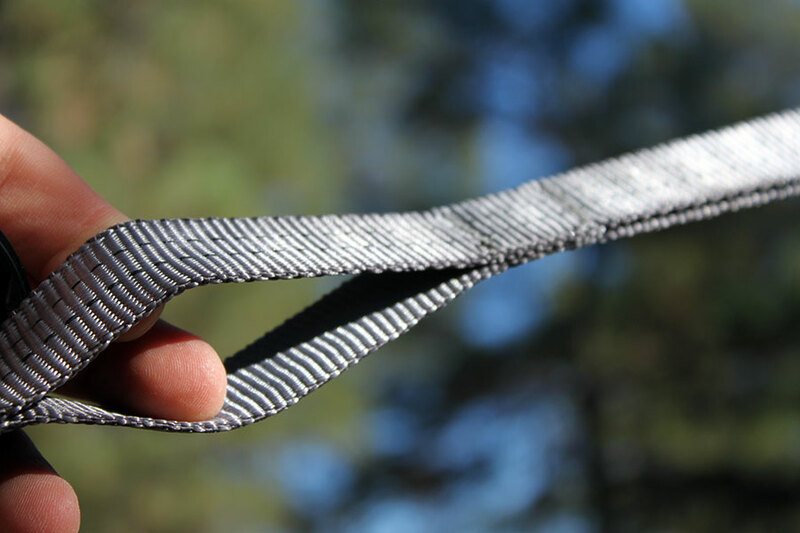 The webbing straps are not only good for protecting the bark on a tree, but the daisy chain loops provide convenient and adjustable clipping points for a hammock. This strap, along with the ENO Atlas Strap, are my top recommendations for new hangers for a strap and suspension combination. Just got mine per your recommendation….they’re great! No more knots for me. Quick and easy, don’t know why anyone would bother with ropes. Where do you get the carabiner shown in the first picture? You mentioned both the ENO Atlas and the Kammok Python, I’ve been trying to decide between those two but haven’t been able to really find any good comparisons. Is there any real difference between them? Or any advantage of one over the other? There are a few feature differences that may make a difference to some people. The Python straps are made from tubular webbing, and the daisy chain design lays flat and packs a little smaller. The Atlas strap loop design keeps the carabiner off the stitching. Functionally, they are nearly identical, so for me, the comparison comes down to availability and price. I ended up going with the Kammok Python for the extra length and ease/speed of packing (they don’t have to be wound, you can just stuff them in their sack).